This Sunday, November 11 is Veterans Day- celebrated with parades and events across the country to honor and celebrate all military personnel who have served in the U.S. armed forces. It was originally called “Armistice Day,” and the date was chosen to commemorate the signing of the “armistice” or truce with Germany to suspend fighting during World War I. In legislation passed in 1938, Nov. 11 was dedicated to the cause of world peace and celebrated and known as “Armistice Day.” This new legal holiday honored World War I veterans. 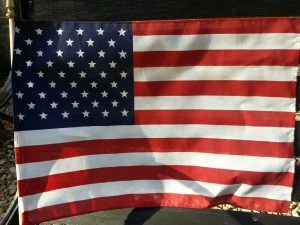 In 1954, after World War II and the Korean War, the 83rd U.S. Congress — at the urging of veterans’ organizations — amended the Act of 1938 and, with the approval of this legislation, Armistice Day was changed to “Veterans Day.” Therefore, Nov. 11 became a day to honor American veterans of all wars. In 1968, the Uniform Holiday Act was enacted. Under this law, Veterans Day was moved to the last Monday of October. Veterans Day under this new law was observed with much confusion. On Sept. 20, 1975, President Gerald R. Ford signed a new law which returned the observance of Veterans Day to its original date of Nov. 11. 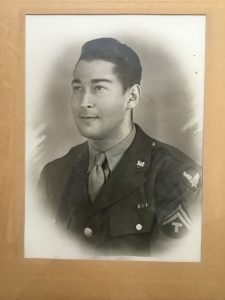 Today I share with you a photo of a very special Veteran, my dad, my hero, Harold D. Gallin, who spent 4 years overseas in WWII serving his country and I honor him and all of our Veterans for their patriotism and the love of this country and for their service so you and I can have the freedoms we cherish as Americans. Thanks to all of our beloved Veterans today and always! This entry was posted in Uncategorized on November 9, 2018 by Kathy Gallin.